Remember when I introduced you (here) to my Kenneth Jay Lane scarab beetle ring I got from Saks Fifth Avenue? I deeply loved this ring-it was so creepy but yet fun at the same time. Yes I said loved! I wore this ring three (3!) times and it broke! Not a bad break, the ring was one size and adjustable with a clip on the inside, and the stupid ring sizer broke off. Yesterday I receive a phone call from Saks asking me where the ring is. Say WHAT?!?! The woman I spoke with said that the warehouse received the envelope and when they opened it there was an empty zip lock bag wrapped in bubble wrap! WHAT?!? Seriously?!?! I thought she was kidding, but nope, she was being serious. I was furious! She said to me that when I find the ring to contact them. What do you mean, "when I find the ring"? I MAILED THE RING TO YOU!! This went on back and forth for a few minutes- I still think the lady thought I never mailed it. I am not a thief!! Thankfully they reimbursed me for the ring, after I went on that I was 1 million percent positive it was in the envelope. I have nothing against Saks. I love the company and have never had a problem with them before. I'm just very sad and upset because I adored this ring and there is no way for me to get another one. One last thing, according to the FedEx tracking number they received (signed for) the package on July 20, 2010 and they just now got around to opening it? Whose to say someone didn't already open it and steal it there and then seal it back up or switch the envelope?? So this is my goodbye to my beloved Kenneth Jay Lane beetle ring. The three times I wore you I always smiled. 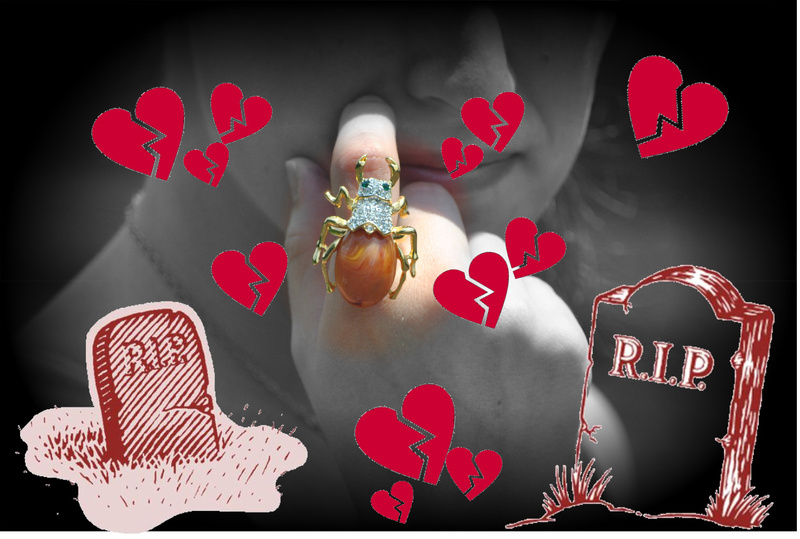 Goodbye beloved beetle ring! that is the craziest story I've ever heard!!! You don't want to point fingers, but it definitely sounds like it was tampered with!